A Mexican restaurant chain known for its large burritos made with organic ingredients and ‘Food With Integrity’ motto has been making the rounds at homosexual pride parades across the country declaring its support for the homosexual lifestyle. Chipotle Mexican Grill participated in both the Capital Pride parade in Washington, D.C. and the Philly Pride parade in Philadelphia this past weekend. 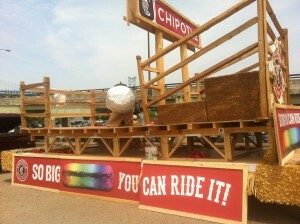 During both events, the chain utilized a float upon which sat a man riding a giant burrito wrapped in tin foil. On the side of the float was a sign that read “So big you can ride it,” with an image of a rainbow-wrapped burrito in the center. The Chipotle logo was also displayed prominently on the float as it made its way down the street while thousands watched and cheered. The Huffington Post reported on the float prior to the events, stating that the company would “make the round of pride parades around the country,” including the D.C. parade on Saturday. It also advised that employees would be wearing “Homo estas?” t-shirts — a pun of “Como estas?” which means “How are you?” in Spanish. Chipotle, which has 1,400 restaurants in 43 states, including in Canada, the UK and France, has become increasingly vocal regarding its support for homosexuality. Earlier this year, the company decided to pull its support from a chapter of the Boy Scouts of America over the organization’s ban on openly homosexual members. Chipotle spokesperson Chris Arnold told reporters that it decided to no longer sponsor the Salt Lake “Scout-O-Rama” as the Scout policy conflicted with company policy. The Scout policy was reportedly brought to the company’s attention by homosexual advocates. “While the Boy Scouts of America is absolutely entitled to whatever policies it wants for the governance of its organization, our policies don’t allow us to support them,” he said. In a TIME Magazine article written by Joel Stein last July, it was also reported that founder Steve Ells is a homosexual, which is likely a factor in the company’s activism. While a number of companies across America have policies that prohibit discrimination against homosexuals, and donate funds to homosexual causes and events, Chipotle’s visibility is greater than most. This year is not the first that the company has participated in pride parades, however, as YouTube footage from last year’s parade in San Francisco shows a Chipotle “Homo estas?” float being pulled by a U-Haul truck down the street as a number of individuals waving rainbow flags ride a giant burrito decorated with a rainbow stripe down the middle. An online photo of the 2011 Minneapolis Pride parade also shows employees taking part in the celebration.